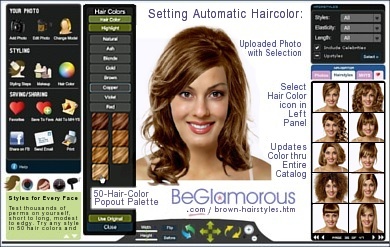 Brown Hair Styles and more: Test thousands of perms, in shades of brown or other colors, online on your photo! Looking for the home page with Q&A? Click here. Save time with powerful features such as Auto Color Option, Wizard Mode and Customized Search. It takes less than 5 seconds to set Automatic Color, which updates the hair color on the chosen hairstyle and throughout the entire catalog (you can easily change back to original colors). Access the Hair Color & Hairstyle Wizard with the Consultations tab, and find the best hairstyle for your facial shape (oval? round? square? oblong? heart? diamond? triangular? ), and the best hair color for your eye color (blue? brown? green? black? hazel?) and for your skin tone/complexion (fair-cool? fair-warm? ruddy? peaches & cream? olive? tan? dark-cool? dark-warm?) For a Customized Search, click the "Advanced" button, and specify words such as "bangs" -- or a celebrity name -- and you can try all the hairstyles tagged with those terms. There's a whole category of virtual haircuts & hairstyles for MEN, too! You can save, share and print finished images (your private gallery of saved brown hair looks will build up real fast), to show friends or to offer ideas to your hairdresser. If you need help or have questions, just click the "Help" button -- or, customer service is ready to assist! This online hairstyle & hair color app (or brown hair app) lets you see how you would look with brown hair, offering women's and men's perms of all types, textures and lengths. The Hair Color Chart (or Hair Color Palette) is accessed in the left control panel for shade comparisons. 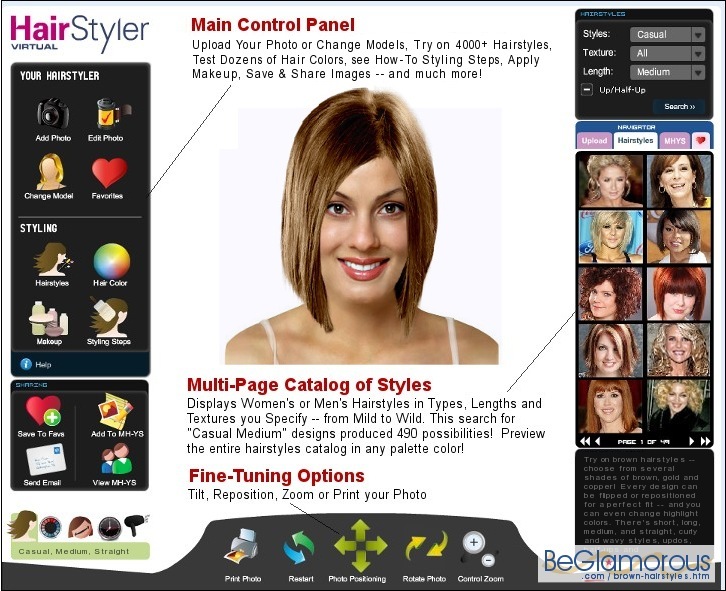 People often wonder whether to dye their hair brown, or what is the best shade of brown hair for blue eyes and fair skin, or for their own particulars; this brown hair simulator tool lets you try hair colors (including dark to light shades of brown, semi- and near-brown) on yourself and change hairstyles online, with all types of hair makeover looks: formal or everyday casual, Hollywood celebrity looks, cute, thick, thin, new & trendy, fashion, hairstyles to make you look younger, wet, beachy, feathered, marriage & bridesmaid, shoulder-length, emo & scene, fringe (parted, blunt, front, side-swept, asymmetrical, wispy, heavy...) quick & easy, hairstyles for women over 50 (or 30, 40, 55, 60, 70...), modern, party, rockstar, corporate business executive and retro/vintage. This interactive generator isn't just for brown hair hairstyles; the designs can be viewed in any other palette color also. This online software program is amazing (you can do basic editing on your uploaded photo to prepare it for usage. The site does not offer services such as free games or downloads) - and the wizard mode's quick quiz helps you find the hairstyle and color that suits you best. Also, most styles include tutorial tips for diy styling at home. If you're pondering "what would I look like with brown hair," or "would I look good with brown hair", this hair color changer tool can show you with your own face how you'd look after changing your hair to brown. Before dying your hair, use the Hairstyle & Hair Color Selector to compare and see how you'd look with brown hair.